by Mary Reames, J.D., LEED AP O+M, TRUE Advisor, Leonardo Academy and Michael Arny, P.E., LEED Fellow, WELL AP, Leonardo Academy — Adjusting the amount of a product or service to better fit your needs is called “right-sizing.” You right-size lots of things – from the amount of outside air you bring in via the building’s HVAC system, to the quantity of lamps you order for your building, to the number of cleaning hours you contract for with your cleaning services vendor. Right-sizing is a practical way to save money, to conserve resources, and to manage your building more efficiently. But have you right-sized your waste disposal services? Once a contract with a waste hauler is signed, many facility managers don’t think about waste hauling again until it’s time to renew the contract. But depending on the length of the contract and the waste disposal practices of the building’s occupants, the amount of waste disposed of – and thus the services needed – may change before the contract term is up. And even when it’s time to renew, it’s tempting to think that the same building will – of course! – still have the same waste hauling needs. Figure 1. Simple Right Sizing Spreadsheet. Recently, one of our clients underwent a waste audit as part of the LEED® for Existing Buildings application process. 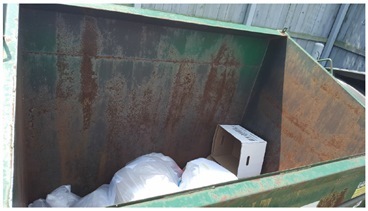 Management was very surprised to learn that, while their cleaning staff was dutifully collecting the recyclables separately from the residual waste, the recyclables were ending up in the compactor with the landfill-bound waste, because the building’s recyclables container was far too small. Not only did this greatly decrease their diversion rate, but it also cost them money; in their case, their waste hauler charged more for waste removal than for recycling removal. Their tenants had been improving their recycling practices, but the waste hauling services had not been modified to reflect those improvements. Other building managers experience the opposite; their containers are only half-full when they are collected – and if the hauler charges by trip rather than by weight, that means management is paying twice as much for waste disposal as they need to. Figure 2. Recycling container, less than 1/4 full. Note the unflattened box, taking up airspace. So how do you know if your current waste hauling services are the right-size? The only way to know is to look. Repeatedly and frequently. For several weeks in a row, take a look at how much is in your containers just before they are collected. Record the amount using the same metric each time. Are they full when they are picked up? Half-full? Half-full on Mondays but completely full on Thursdays? Also look at what is in the containers. Are there recyclables in the waste containers, or vice versa? Are the cardboard boxes flattened, or are they taking up air space? Keep recording the amounts and types of waste for a long enough period of time to understand the patterns in your building. There are a number of apps and online tools that can help you record this data, but even a simple spreadsheet, like the one in Figure 1, can work. Taking photos, like the one in Figure 2, will also help you look for trends. Once you have collected the data, it’s time to analyze. If you keep seeing that your containers are only half-full on Mondays, perhaps you need to adjust the collection schedule so that pickup is on Tuesdays instead. If some of the containers are always half full when collected, request a different-sized container from your waste hauler. If there is no discernable pattern, perhaps your waste hauler will collect on request rather than on a set schedule. Show your findings to your waste hauler and collaborate on the combination of containers and pickups that will best suit the needs of your building. Right-sizing your waste disposal services is an important step in managing your waste as efficiently as possible. In fact, it is one of the first steps on the road to achieving True® Zero Waste certification. Zero waste is a management approach to waste that emphasizes waste prevention as well as waste diversion. A TRUE Zero Waste certification means, among other things, that a company or project has eliminated and/or diverted at least 90% of its solid, non-hazardous wastes from the landfill, incinerator, or environment over the last 12 months. 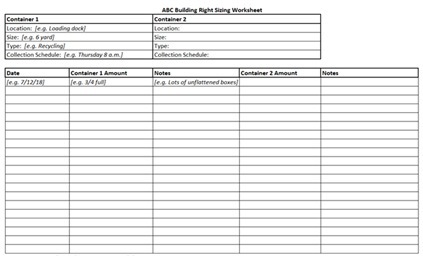 Even if you have no plans to attempt a zero-waste goal, undertaking a right-sizing exercise can help you operate your building more efficiently and more cost effectively. A TRUE Advisor – a professional who understands the requirements of the TRUE rating system and how to advance zero waste efforts in a facility or company – can help you conduct a right-sizing exercise and work with your waste hauler on a plan that will make the most of your waste hauling budget. See how you can meet sustainability goals while improving your earning power through this new ISSA/IEHA credential November 2, 2018 In "Associations and Organizations"